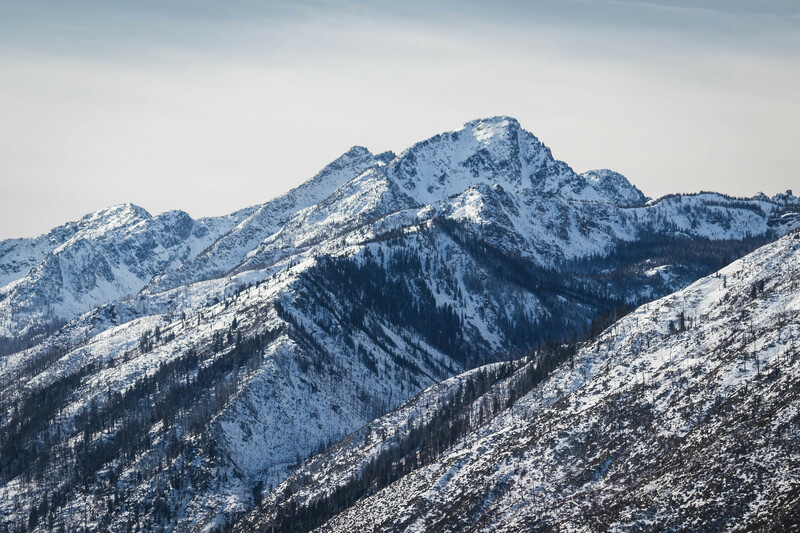 In the past, black pup and I had hiked a small section of Icicle Ridge from the Fourth of July Creek Trail junction to the lookout, but we had never hiked the ridge at great length. While waiting for mountain pass conditions to improve, yellow pup and I spent another day out east to explore the eastern end of the ridge. 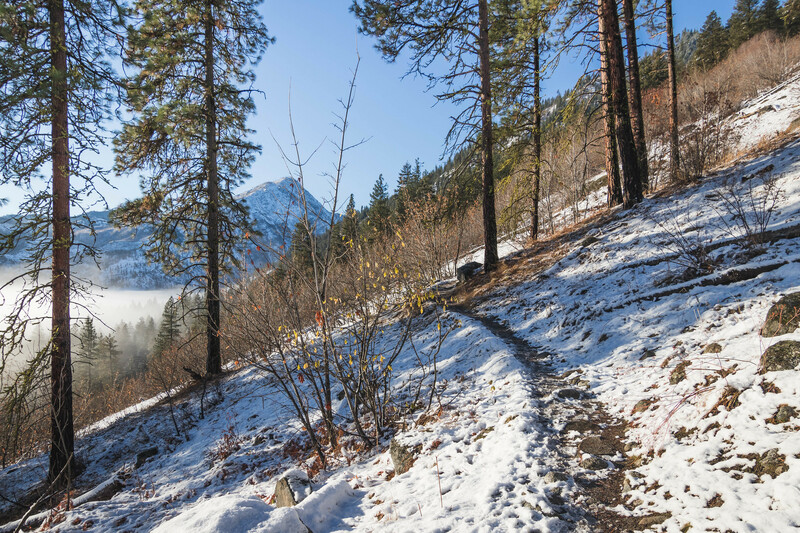 Even with the recent snowfall, the trail appeared to have gotten plenty of foot traffic judging by the number of boot tracks in the snow. Apart from being in the shade, the morning’s cold temperatures kept lower parts of the trail under some thin ice. Just over two miles of hiking through many switchbacks to the 2,880′ saddle. The trail continued to climb and switchbacked along the south side of the ridge. And after coming into contact with ridge crest three more times, it eventually stayed on the crest past 4,200′. 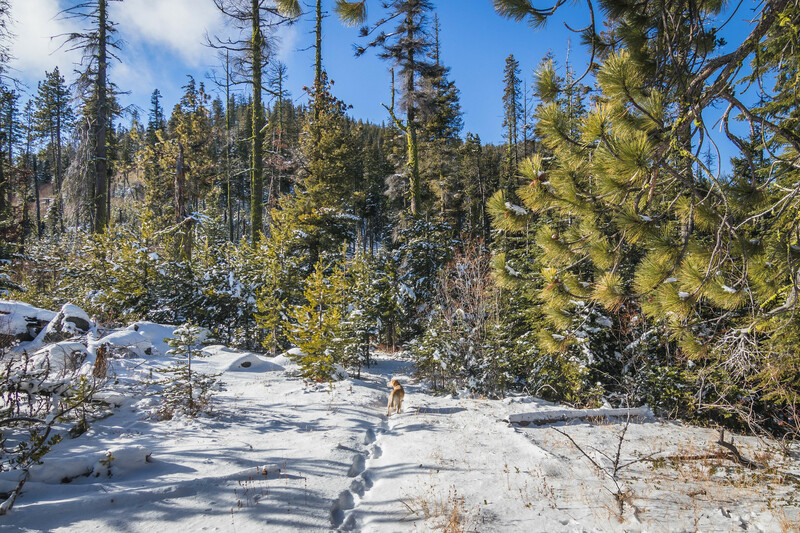 The day-old boot tracks we had been following turned around at 4,800′ where snow had suddenly deepened; I put on snowshoes here. Another 1,000′ of hiking in the most forested section of the ridge, we finally came out onto open and more leveled terrain at 5,200′. 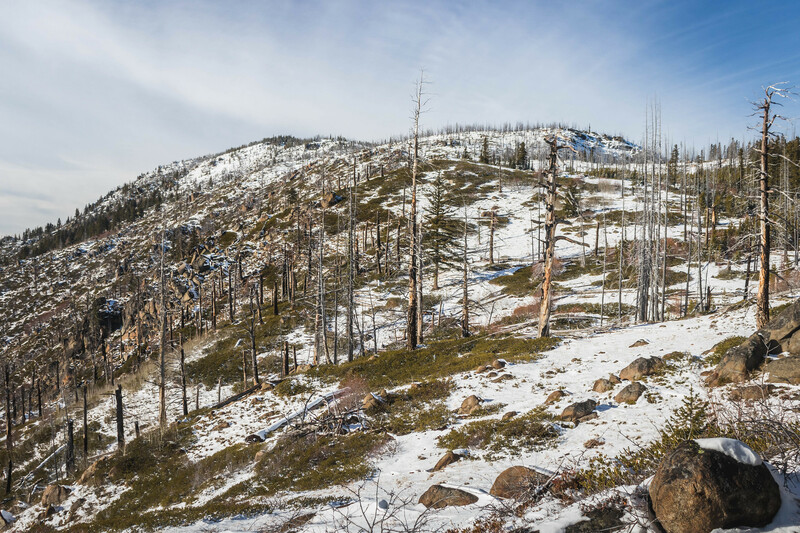 We hiked for another half a mile through a small section of open forest before finally stopping at the next clearing, facing the opening of the Eightmile Creek drainage. We’re now six miles from the trailhead. 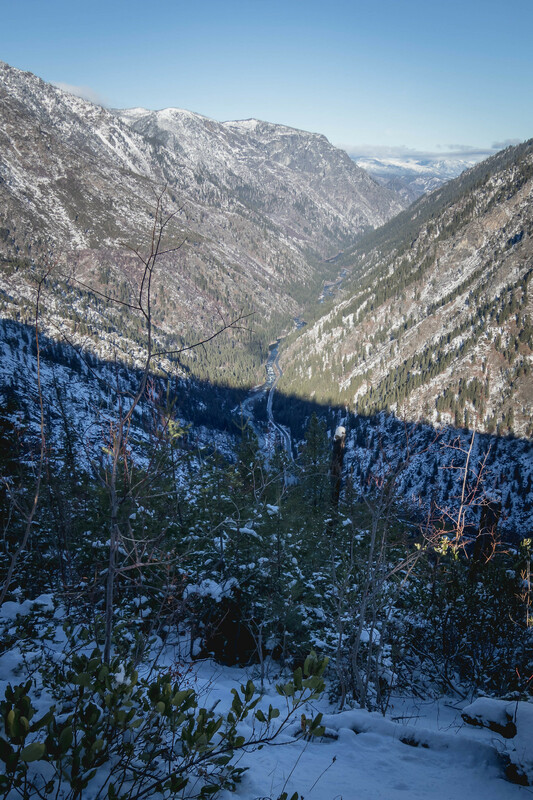 This was the closest I’d ever seen the mountains in The Enchantments area in fresh snow. Something about the snow that really brought out the contrasts between the lights and the darks, casting a completely different personality over these high points. We didn’t stay long on the ridge, as I wanted to get back on the road and hopefully over Snoqualmie Pass before dark. After getting back down to the 2,800′ saddle, pup and I made a quick detour to Tumwater Tower overlooking the City of Leavenworth before hiking back down to the car.